My tasters were skeptical at best when I rattled off this list of ingredients. The undeniably savoury aspect seems out of place for a cookie but the key is moderation. 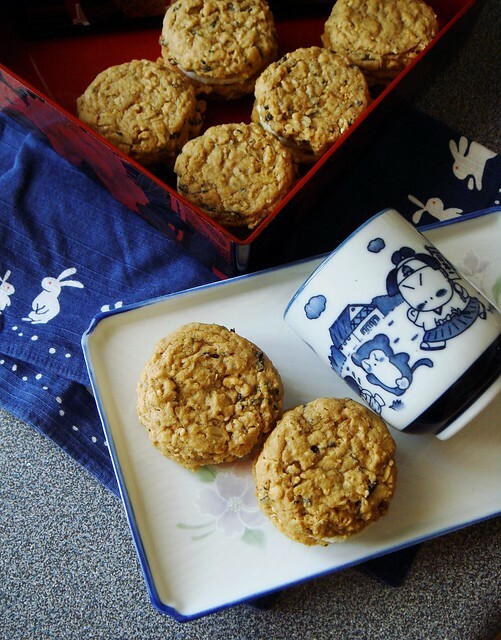 Sesame seeds add great crunch to the already soft and cakey cookies to enhance the nutty taste of kinako. 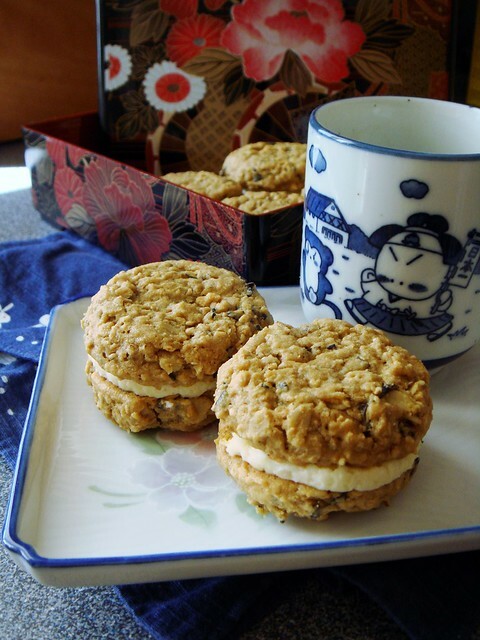 The cookies have a hint of the sea thanks of toasted nori. 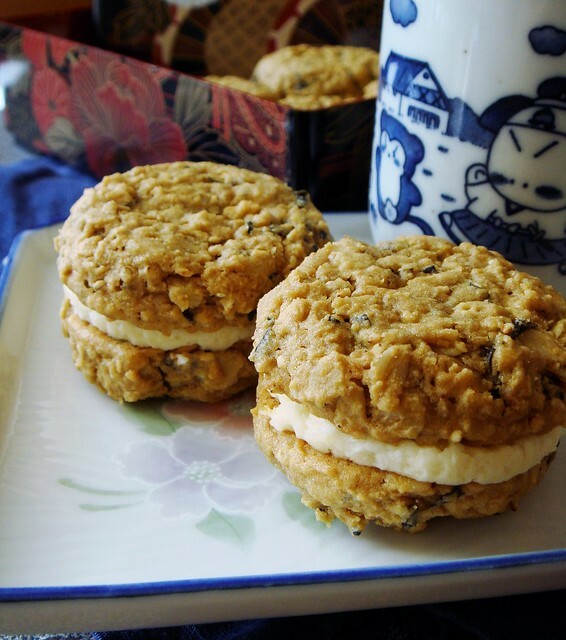 But it is the richness of miso buttercream that makes it memorable. Miso is very salty and intense so a little goes a long way. It balances out the sweetness of the buttercream with just a bit of funk. I love it. Give it a try! I would love to hear what you think. Preheat oven to 375F. Line two 11x17 baking sheets with parchment paper, set aside. In a large mixing bowl, stir together flour, kinako, baking soda, baking powder, ground ginger, and salt. Cream 117g of butter with brown sugar in the bowl of a stand mixer using the paddle attachment for 3 minutes on medium speed until light and fluffy. Add egg and egg yolk. Mix until completely incorporated. Add reserved flour mixture. Mix on low speed just until combined. Fold in oats, sesame seeds, and nori using a large sturdy spatula by hand. Use a 1 tablespoon scoop to portion cookie dough evenly spaced on prepared baking sheet. Baking for 10 minutes or until top of cookie is just set (dry to touch). As soon as the cookies come out of the oven, gently flatten using bottle of a bowl covered with a square of parchment paper. No need to press down hard. Just let the weight of the bowl sink in. Cool cookies completely. To make frosting, whip 100g butter, icing sugar, and miso using paddle attachment of stand mixer until light and fluffy. Dollop 1.5 teaspoon of frost on half of the cookies and cover with a second cookie to make sandwiches. The frosting will not completely set and stay soft. Cookies keep well at room temperature for 2 days.